Today’s Washington Post carried a headline news article for a few hours about the funeral service for Michael Brown, the Ferguson teenager who was shot by a police officer. I checked the online version shortly after the article was posted and scanned the first few comments. My eyes widened in horror at the vitriol and venom posted by anonymous commenters. I don’t think I’ve ever before read every comment posted on an article, but I skimmed all of them to see if anyone had posted a sympathetic or even a reasonable comment. At the time that I read, 58 comments had been posted, and 57 of them were offensive and ugly. Whether Brown committed a crime or not, no human being deserves, especially on the day of his funeral, to have such things said of him. And those comments proved the very point that the protestors have been trying to make–that an insidious racism is thriving in our democracy. I didn’t have time at the time I read the comments to join the sole voice crying in that wilderness of hatred, but I vowed to make time this evening to post a comment. When I returned to the site, the article had been moved down the page, and the comment section had been disabled. Though I was disappointed not to be able to challenge the hostility, I applauded the Post for disabling the comment feature. And I hope they also banned those who clearly defied the user agreement. Reading those comments convinced me of something I had never before considered: No one should be able to post a comment on a blog or article without using his or her real name. Even the most blatant racists I’ve ever known—and since I grew up in an all-white town, I’ve known a few—would not dare voice comments aloud like those I read in the Post today. 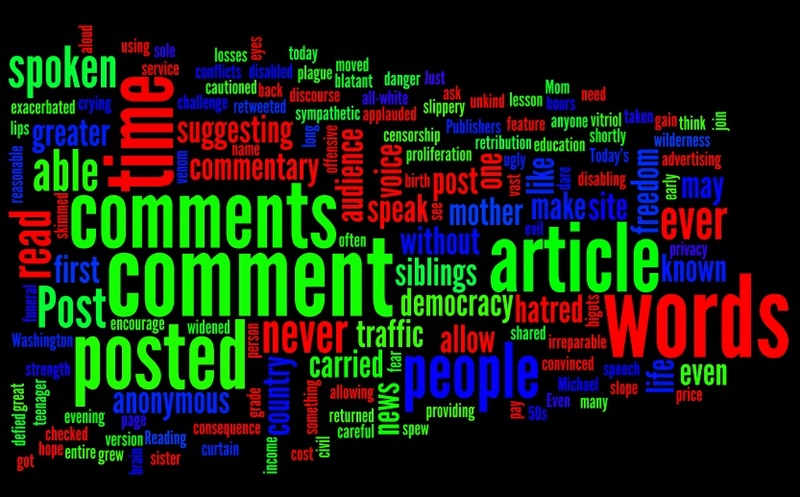 Just as the 24-hour news cycle has exacerbated our conflicts, the proliferation of websites that allow anonymous commentary is doing irreparable damage to our democracy. We will never be able to have civil discourse about the issues that plague us as long as we encourage people to speak evil to a vast audience while providing them a curtain of privacy and protection. I am not suggesting censorship. We have freedom of speech in this country, even for bigots. But I am suggesting that it may be time to make people own the words they speak. Mom, though she had only a ninth grade education, was the first person to teach me about the power of words. It is a lesson I’ve carried with me all of my life. She taught me to be careful of the slippery slope from my brain to my lips. We need more people in our country who, like my mother, know the strength of words spoken in love and the danger of words spoken in hatred. And we have little to gain from allowing people the freedom to spew maliciousness without fear of retribution or consequence. Publishers allow such commentary only because it increases traffic on the site. The more controversial, the greater the audience as comments are liked and shared and retweeted. The more traffic, the greater the advertising income. But at what cost? The price we ultimately pay may be the demise of democracy. Previous PostHow Does the Media Shape Our Views of Race?Next PostWho is My Neighbor? I agree that anonymous comments allow people to spew thoughts that they would never share if their identity were known. However, if anonymity were removed, I would hesitate to comment at all. I would be afraid that those same people that spew hate would hunt me down for my comments, no matter how diplomatic I try to be.